I’m loving the nice Spring weather, and the all-in-one salad dinners that start to sound good this time of year. This week, I tried a recipe for Lentil Salad with Tomatoes that I found at Health.com, and I couldn’t wait to share it! Low in the stuff you don’t want but full of the stuff you do, this salad is really refreshing and very filling. Have you read up on the benefits of lentils? This is one food that you should really get to know. Lentils are good for your heart, your digestion, and they help stabilize your blood sugar. Also, they are full of protein! Twenty-six percent of the calories in lentils come from protein, which is even higher than the protein content of a piece of roasted chicken (25%). They soak up flavors and add texture to your meal, making them a really good addition to soups, salads and stews. After doing a little research, I’m sold. I’ll be working lentils into our diet more and more! Got any favorite lentil recipes?!? For this recipe, you’ll want to cook lentils with some bay leaves. I replaced the cooking water with vegetable stock, to add some extra flavor. While the lentils are cooking, wash and chop some spinach (the original recipe calls for watercress, but our supermarket didn’t have any organic so we used spinach). You can add all sorts of veggies to this salad…I used spinach, red onion, cherry tomatoes, red bell pepper, and diced cucumber. Avocado, celery, and artichoke hearts come to mind as well! The dressing is easy, just chop some capers and mix them up with balsamic vinegar, garlic, and extra virgin olive oil. I put all the ingredients for the dressing in a mason jar and shook it up, which made it fast and easy! I wanted the spinach in the salad to be just a little bit wilted, so I put the lentils in with the vegetables while they were still hot and tossed it all with the dressing. So fast, so easy and so yummy! I could eat this salad all day, and in fact I did eat it for dinner and then again for lunch the next day (I doubled the recipe for our family of 5, and we had a nice meal plus some left over). Our leftovers were gone before I had a chance to try it, but I think that leftover lentil salad with tomatoes would go great in a breakfast omelette! Spring weather to me means bringing on all the spring salads - this lentil salad with tomatoes is a great addition to all your favorite salads. Adapted from this recipe. In a saucepan, bring the lentils, bay leaves and stock or water to a boil. Reduce heat, and simmer for 18-20 minutes or until lentils are tender. 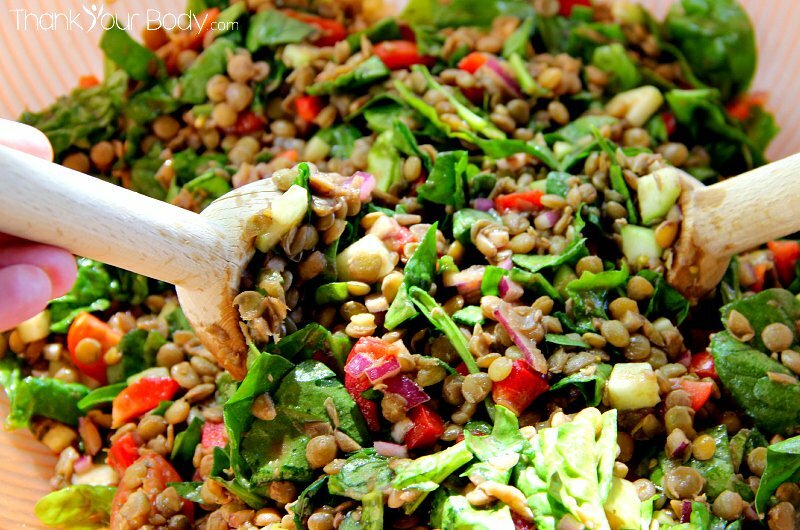 While the lentils are cooking, wash and chop the salad ingredients and put them in a large salad bowl. Prepare the dressing: Mix the chopped capers, vinegar, garlic and oil (I like to use a mason jar...put in the ingredients and shake well). 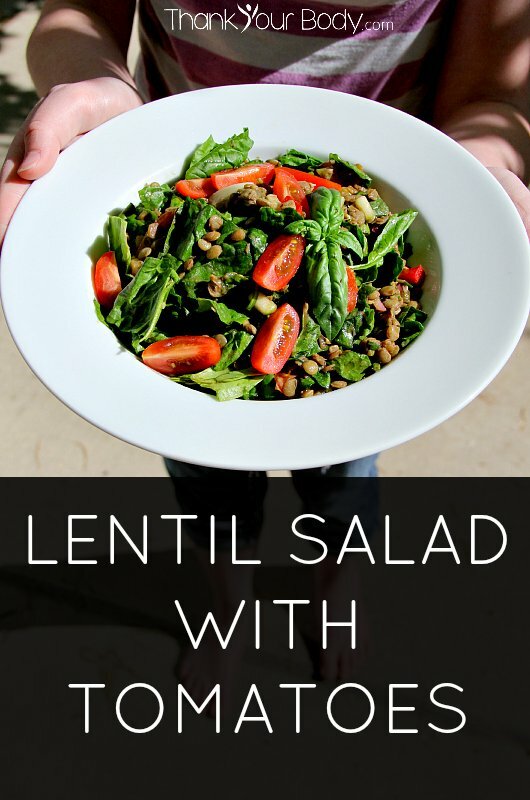 While the lentils are still hot, toss them with the salad greens and dressing.